Cryptocurrency markets had an overnight meltdown last week. 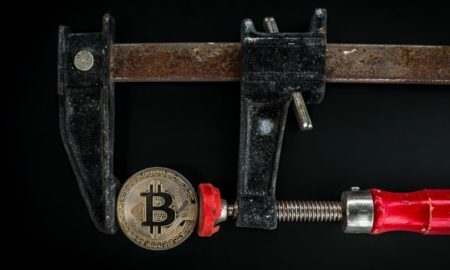 The slump had Bitcoin (BTC) fall below US$5,000 for the first time since October 2017 – a marked Bitcoin crash. In fact, the market has been testing $4,000 for BTC, but it seems to be finding support there – for now. Typically, what happens when Bitcoin falls is that all other major alt-coins follow the same trend. Whats bad for BTC is bad for crypto. Guilt by association? With the way crypto markets are run, it’s difficult to pinpoint what caused the dramatic slump. Remember… this is a bit of a secretive world. The world’s three largest exchanges by trading volume are all based in offshore tax havens. Not such a big surprise, given that the roots of crypto idealism is rooted in anonymous asset ownership. What might be core cause of the drop? There’s been an ongoing dispute amongst Bitcoin Cash (BCH) developers which created the hard fork of the currency over a week ago. Bitcoin Cash originally came about in August of 2017, a fork started by developers who wanted to speed up Bitcoin’s transactions ability. The current disagreement between BCH developers is that some wanted to add new protocols and others wanted to keep it the same. The most recent fork with BCH created Bitcoin ABC (BCH with new protocols) and Bitcoin Satoshi’s Vision. Both are eagerly and aggressively mining blocks to gain control of their blockchains. This is likely the reason for the recent price drop. “Both sides are mining blocks at a loss, where the electricity and hardware costs are greater than the rewards from mining,” said Adrian Przelozny, CEO of Independent Reserve. Will this be the end of Bitcoin Cash? Likely not. Bitcoin Cash has been around for a long time and evidence has it that they have a large reserve of crypto at their disposal. The battling parties are said to have had dumped a lot of crypto into the market in order to finance their mining operations. These aggressive battles and the recent hard fork of Bitcoin Cash is probably what is impacting the global drop in the crypto market. Just before the fork Bitcoin Cash halted all trading. No deposits or withdrawals. At this time the blockchain becomes too unstable, with too much uncertainty, no one really ever knows how it will all play out. Seems like all the huff and puff about the real value of crypto goes out the window under certain conditions. Odd given that crypto advocates hold as their main argument that crypto is inherently stable and free of regional economic fluctuations. If that is the case, why is a halt necessary? Is this most recent Bitcoin crash an indication that there’s a bigger problem? How can it be considered a real currency – ever? Overall this hasn’t been a bad thing. Since prices began falling both Independent Reserve and Huobi had a sharp rise in trading volumes. Since the BCH hard fork, trading volumes have gone up 200%. All of these increased trading volumes aren’t that unusual as volatility rises. All of this action will settle down, given time – but where will BTC finish the year?